The Spidi Track Wind Replica tracksuit summarizes Spidi's know-how in the field of racing suits. It's tailored with premium Italian cowhide leather 1.2 / 1.3 mm thick, combined with stretch material structures and neoprene inserts to increase the level of comfort while racing. Protectors include adjustable knee CE Multitech and CE hips abd the Track Wind Pro comes with a back protector-ready and chest protector-ready insert pockets. Spidi produces professional grade one and two piece motorcycle leather suits for canyon carving, track, and racing from the finest Italian leathers. Located in the Veneto region of Northern Italy, Spidi has access to Italy’s best tanneries. Riders wearing Spidi receive of 40 years of experience from racing in MotoGP, WSBK and National championships for the best race suits available. 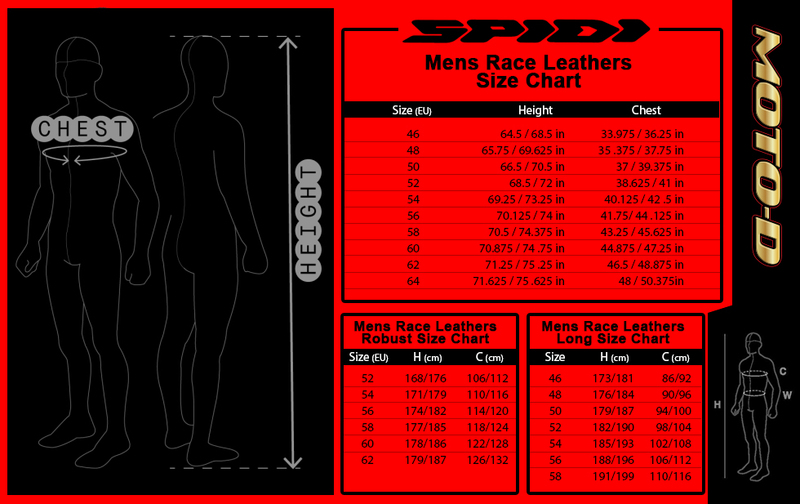 Click the button below to add the SPIDI "Track Wind Replica" Motorcycle Racing Leather Suit Red/White to your wish list.